Fight back: Report Mississippi & North Carolina HATE here! EEOC Commissioner: "Contrary state or local laws provide no defense to an employer that violates Title VII"
Update: Well, Jennifer Usher has responded to this post with Mr. Sandeen Has A Complete Meltdown. I think I need to make a point one more time because Jennifer is still imagining that I’m conspiring with others to cause her harm. Specifically, I’ve never conspired with someone named Willow to take any coordinated action against Jennifer. In general, I’ve never done any conspiring with anyone at all at any time whatsoever in any matter that relates to Jennifer Usher. As much as she may believe I have engaged in some coordinated conspiracy to cause her harm, she’s absolutely wrong in that belief. After having been cyberbullied — cyberstalked (here, near end of post) and cyberharassed twice (here and here) — I’ve tended to treat my harshest online critics with more caution than I previously had. I now understand that people I’ve never met in the brick-and-mortar world actually have despised me enough to have seriously planned, and in one case actually accomplishing, real harm to me in the brick-and-mortar world. That doesn’t mean that I don’t have what is referred to as internet trolls — folk who won’t take any actions that don’t involve typing away at their keyboards. 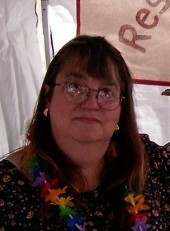 The internet troll that currently is fixated on me is Jennifer Usher of the Just Jennifer blog. From a subjective point of view, she seems to me to engage more in flame trolling rather than a run-of-the-mill trolling. [I]ntentionally starting a flame war by posting a provocative or offensive message, sometimes referred to as “flamebait.” The flame troll may be motivated by the attention the post receives, or by the entertainment value provided by those who have been angered by the message. How did I come to believe Jennifer Usher is a troll? It’s found in her own words within the comment thread of the column I wrote, as well as the article and Just Jennifer blog post she wrote in response to my column and its comment thread. In the original column’s comment thread, she’s written 39 comments — one shy of half the comments in the comment thread of 80 comments — with a word count of 4,297 words. In her JustJennifer blog, she wrote a blog entry with a word count of 1,494 words. In the comment thread for her own blog entry, she’s written 8 of the 18 comments for a total of another 896 words. In other words, for every word I wrote in my recent LGBT Weekly column she wrote about 9 words related to her blog entry, her blog entry’s comment thread, and the comment thread for my LGBT Weekly column. But in the meantime, I will be enjoying the fact that I got under Williams skin, and caused a complete meltdown. That’s how you can tell you are winning…when the fools start losing it big time. In Williams’ case, the usual result is block the person, and then start personal attacks. But, he can’t seem to get away with that here….so, it has to escalate a bit. I asked my LGBT Weekly editor to delete that comment, as well as an entry from one other commenter, due to misgendering, so it and that other comment from that other commenter may be deleted at this point. But that said, note that Jennifer is “enjoying” behavior that she perceived as entertaining. This fits with the flame trolling component of finding “entertainment value provided by those who have been angered by the message” — although Jennifer just perceived anger in Cristan where I believe there’s only annoyance. I suspect Sandeen invited some people (he has already done that on a smaller scale) hoping to bury me in comments. Didn’t quite work very well for him…. As it was, he pulled just about every trick in the book… I imagine he thought I would whither in the face of a massive load of absurd rhetoric. Then there are these statements from Jennifer in her post. I could be wrong, but the whole mess that resulted from one comment had the feel of a very organized effort. I suspect Sandeen invited some people (he has already done that on a smaller scale) hoping to bury me in comments. Didn’t quite work very well for him…. As it was, he pulled just about every trick in the book… I imagine he thought I would whither in the face of a massive load of absurd rhetoric. When that did not work, the insults started. As I have pointed out, my identity is quite secure thank you. Repeating lies started by a cyberstalker is not going to scare me off. Anyone I care about, knows better, and anyone who believes that crap…well, I could care less. …I went to check Twitter again…and discovered that my account had been suspended for “abuse.” Now, this is where it gets interesting. I am not sure how Sandeen managed to pull such a stunt off. I had made all of four tweets. Actually, except for occasionally cyberstalking me, Sandeen has pretty much avoided responding to my posts. I guess being humiliated as much as he has been will do that to a fellow. I decided to avoid responding to her for the most part because feeding the trolls just results in more trolling. This, by the way, is going to be my first and only post on Jennifer just for that reason. Many have been sucked into responding to her as if she’ll respond to facts or reason, but her worldview is set in stone — then there are just flame wars. There is no point in getting angry at her — it just feeds whatever empty spot she has in her soul that needs attention, even if it’s the negative attention that a flame troll engenders. And feeling humiliated by her? Wow — just delusional. But, I guess the idea that I’m spending a lot of time fretting over what she writes feeds that desire for attention and a need for powerful relevance. In other words, The Church of the Advent of Christ the King is supposed to be welcoming of transgender people, but their then staff member was slamming misgendering transgender, as well as transsexual people who don’t identify as transgender, in her blog. As someone raised in Christian faith who still holds values I learned in that upbringing, I find Jennifer being staff and/or lay leadership at a congregation that’s identified as welcoming to transgender identified congregants to be a very disturbing concept. 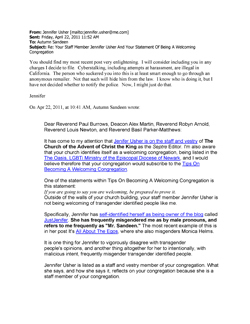 I wanted the ministers at her church to know how one of their lay leaders was acting outside of the church towards people the church was supposed to be welcoming towards, so I wrote the church — and as I said before, I cc’d her on that email. I did nothing behind her back. Fair use is very limited. Using copyright material specifically to attack the owner of the copyright is not fair use. I guess her faith is an in-the-church-building faith, and not a faith she takes with her out her church’s doors. 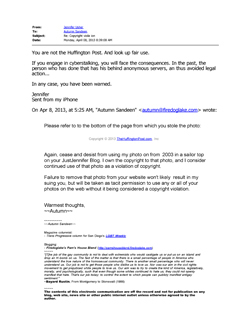 If emailing The Church of the Advent of Christ the King about their less than welcoming subdeacon is cyberstalking; if emailing Jennifer Usher to inform her that she should take down a copyrighted photo if she doesn’t want to give me the ability to copy her copyrighted material without repercussion, then certainly emailing the editor of LGBT Weekly accusing me of cyberstalking in an attempt to have me removed as a columnist would probably qualify as its own form of cyberstalking. And, last week, Jennifer emailed my LGBT Weekly editor in an attempt to have me removed as a columnist. She told my editor that I’d cyberstalked her multiple times — and she didn’t cc me on her email to LGBT Weekly as I did on my email to her church. Hey, it’s not creepy at all hat Jennifer Usher has written 105 blog entries that mention me, most of which are about me. It’s not creepy obsession to be the blogger who has focused on me so much that no other blogger comes close to have written about me as much as she has. It’s not creepy at all that she’s hyper-focusing on me, but claims to be a victim as soon as I put focus back on her…right? Well, wrong. Yet when I don’t pay attention to her, she comments that I’m ignoring her because I must be “humiliated.” And, when I’m doing nothing to engage her, she imagines I’m sock puppeting responses to her, meat puppeting to get others to write about her in an attempt to shut her down, and imagines I’m writing social media sites to silence her. No, that’s not creepy at all either…right? I’m undermotivated to spend as much time focusing on her as she feels the need to focus on me. I understand she’s a flame troll, and has pretty much been one since 1993 when she was a troll on Usenet. But hey, I want her to read this and know she’s delusional when she believes I’m so focused on her I’d engage in sock and meat puppeting. One ironic aspect of Jennifer’s history is that Jennifer has actually participated in transgender empowerment — working on behalf of trans people. For example, if you join the YahooGroup transgendernews, you can do a group search that will show you that she posted to the archive nine times. 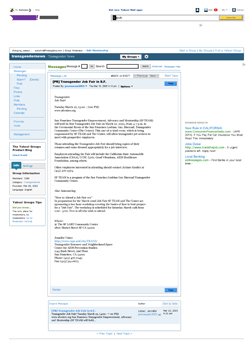 In fact, her first post to that archive was a press release announcing a transgender job fair in San Francisco. And as a Health Educator for the University of California, San Francisco, Jennifer is listed as the editor of a document entitled San Francisco Transgender Resource Guide (Second Edition). It’s sad. Jennifer is a fairly articulate woman who wastes her writing skills trying to tear down not only the views of others with an internet presence but other transgender and transsexual people with internet presence she doesn’t consider to be true transsexuals. She’s worked in the past for an organization that embraced trans community diversity during the mid-2000s and did some good things for folk she now sees as transsexual pretenders. Y’know, it’s not enough to know what you’re against: you have to know what you’re for, and then be prepared to work and sacrifice to see your goals achieved. Jennifer knows what she’s against, but as a keyboard “activist” she doesn’t seem to be for anything and certainly doesn’t step away from her keyboard to actually achieve anything of value or meaning. What good she imagines she’s doing at her “welcoming” church is more than offset by her hateful rants against those who her church consider being God’s children. [E]veryone must be quick to hear, slow to speak and slow to anger; for the anger of man does not achieve the righteousness of God. Therefore, putting aside all filthiness and all that remains of wickedness, in humility receive the word implanted, which is able to save your souls. But prove yourselves doers of the word, and not merely hearers who delude themselves. For if anyone is a hearer of the word and not a doer, he is like a man who looks at his natural face in a mirror; for once he has looked at himself and gone away, he has immediately forgotten what kind of person he was. But one who looks intently at the perfect law, the law of liberty, and abides by it, not having become a forgetful hearer but an effectual doer, this man will be blessed in what he does.